TENTH A.F. HQ., INDIA - Searching out a means of contributing "just a little more" to the war effort (having already purchased war bonds, donated blood to the Red Cross, held down absenteeism and given their time as air raid wardens), the 500 members of the little Universal Engineering Co. of Frankenmuth, Mich., conceived the idea of purchasing an airplane and turning it over to the United States Army Air Force. In a very short time, they had enough cash to buy a P-51 Mustang fighter plane. That plane is making history today in the CBI Theater. When it was turned over to the USAAF, it was named Spirit of Universal. When it got overseas it was renamed Jackie, in honor of Mrs. Jacqueline England, wife of its pilot, Maj. (then Capt.) 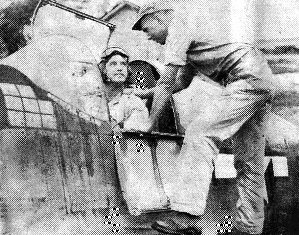 James J. England, of Jackson, Tenn.
To date, that plane - member of the "Yellow Scorpion Squadron" - has destroyed eight Japanese planes and damaged three over Burma. On several occasions, other pilots than England flew it, notably Lt. William W. Griffith. Between the two, they have two DFC's two Air Medals, numerous clusters to each and the Silver Star. England has credit for all the sky victories, while Griffith won the Silver Star for "gallantry in action." For the information of the good people of Universal Engineering Co., their plane has done considerable damage while flying air support over Burma, killing many enemy foot soldiers and destroying fuel, ammunition and storage dumps, barracks areas, bridges and sundry other installations. They are also appraised that they never would be able to recognize the ship today, because in its more than 100 combat missions and 600 hours against the enemy, it has been shot up quite frequently. Besides having had 58 different holes, 38 from one mission, it has had two new wing tips, two gas tanks, stress plate, engine change, prop, aileron assembly, tail section, stabilizer, electric conduit in the left wheel and several canopies. Yet it still sees action regularly in combat. When Griffith won the Silver Star for his feat of bringing back the plane when it was theoretically unflyable, the Universal employees rewarded him and his crew chief, S/Sgt. Francis L. Goering with $100 war bonds.